I've been wanting to read this one for a while...so imagine my happiness when they had a deal on it in the Kindle store! $1.99? Yes, please. That said...after reading it, I'd go as far as to say I could have paid the publisher's retail price and have been satisfied with the purchase. What a fun, scary read! 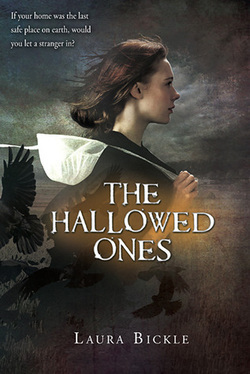 In The Hallowed Ones an Amish teenager, Katie, is close to leaving on Rumspringa with her friend Elijah. Not sure if she is ready to fully accept her future as an Amish woman, Katie enjoys the small rebellions - from a Wonder Woman comic collection to a Coke. Due to their isolation in their Amish community, Katie and her neighbors don't notice the chaos and panic going on in the Outside world until a LifeFlight helicopter crashes in their cornfield. While trying to rescue the pilot, Katie catches a glimpse of some creature in the wreckage. What was that creature? What is The Darkness that is threatening death and destruction to her family, lifestyle and, possibly, her faith? c) there were VAMPIRES. Amish...and vampires. And not sparkly, glittery Cullen-ish vampires that seem to dominate YA after the Twilight series. These vampires are not glamorous. At all. In fact, they are downright scary as crap. So, yeah...it seemed to be a winning combination. I only had one minor quibble with the book... Throughout the story, Katie is forced to evaluate her faith and belief system. I believe that just about everyone (but especially those who have grown up in a faith/belief system) who follows a religion, goes through a time where you are evaluating it and internalizing it...I guess the best way to phrase it would be that time when it goes from "the faith of your parents" to "your faith". I thought it was really interesting to read Katie go through that time frame in her life...and I thought the questions that she asked about her faith in God to be really realistic and typical of someone who is going through that. That's not my quibble. My quibble is that I sensed the author may have had a small agenda about faith - I definitely got the sense that the author believes any faith works as long as you have faith. The way any hallowed ground repelled the vampires (from Christian to Buddhist to Wiccan, etc)...and the way Alex suddenly believed in the Egyptian tattoos on his body and that sudden faith in the old Egyptian gods saved him from the vampires...well, it just seemed like "any port in a storm" will do. And even still...that's not really my quibble. My quibble is that I hate it when authors try to obviously push an agenda in fiction. You can't write nonfiction without an agenda...that's pretty much an established fact. Everything nonfiction has a bias. But, I think you can tell a fictional story without turning it into a diatribe against a monotheistic belief system. So...yeah...I don't like it when authors push an agenda (no matter what that agenda is). I want to read a story to read a story...not get involved in a deep debate about whatever the agenda is about. BUT. I still loved this book. And I will most definitely seek out number two. And I am rooting for Alex and Katie...definitely glad Elijah is (hopefully?) out of the picture.